It’s been eight months since Hurricane Maria obliterated Puerto Rico’s electrical grid and left 1.3 million people without power. Although the island is still in a very precarious situation today, there is also hope and belief in the resilience of the people who call it home—two of the most prominent recurring themes featured all throughout Ricanstruction: Reminiscing & Rebuilding Puerto Rico. The new anthology, edited by Edgardo Miranda-Rodriguez, follows his original character La Borinqueña through dozens of short, one-shot adventures as she teams up with a number of DC’s classic heroes to explore, celebrate, and protect all that Puerto Rico has to offer. Many of the stories are deeply personal and focus on the writers’ own connections to Puerto Rico, like Mayda Del Valle, Dominike Stanton, and Edgar Delgado’s “Mighty Maité.” Others, like “Blackpower,” use superheroes like Static in order to provide commentary about the kinds of real world infrastructural challenges Puerto Rico still faces. 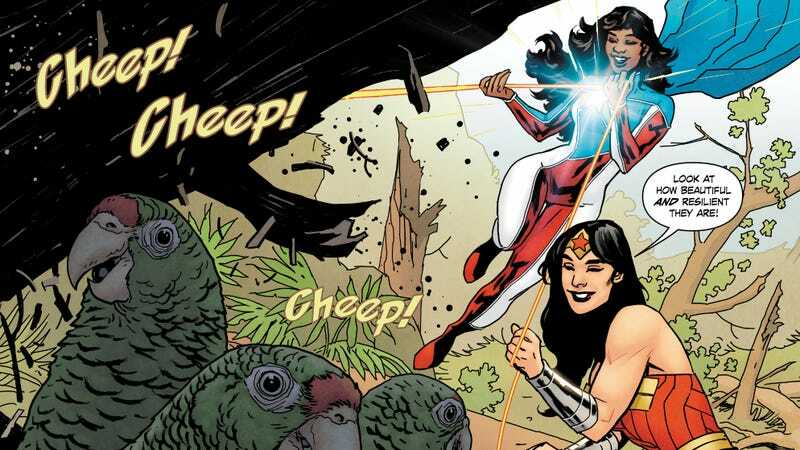 Though Ricanstruction is chock full of the kinds of superheroes that (in other comics) might attempt to use their abilities to magically “solve” the island’s problems, the stories are careful to emphasize that you need a different kind of strength in order to enact that sort of change in the real world. For every story where La Borinqueña uses her superpowers to deal with misguided villains, Ricanstruction also includes small vignettes about the everyday kinds of courage and cooperation that are so crucial for communities to come back from the kinds of natural disasters that have affected Puerto Rico. In choosing to emphasize the power community and collaboration over feats of physical strength, Ricanstruction reminds you superheroes are idealized embodiments of heroism that all people are capable of. Puerto Rico has been shaken by storms in the past and it’s likely that it will face more in the future. What Ricanstruction wants you to remember, though, is that so long as there’s hope—and a concerted, meaningful investment of the funds necessary to strengthen Puerto Rican’s infrastructure for the long term—the island’s going to be all right. Ricanstruction: Reminiscing & Rebuilding Puerto Rico is in stores now. All proceeds from the anthology’s sales are being donated to a number of the organizations working to help rebuild Puerto Rico.